Republicans want to "run out the clock" on filling the Supreme court vacancy left by the death of Justice Antonin Scalia. A woman's right to choose, civil liberties, environmental protection, civil rights, campaign finance, gay rights, corporate power and a wide range of other profound issues hang in the balance. 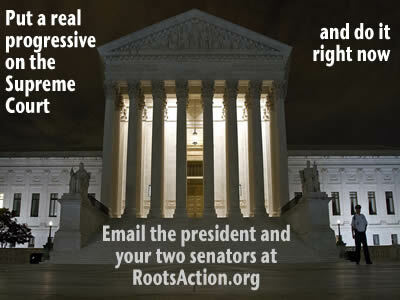 As a constituent, I urge the nomination and swift confirmation of a real progressive to the United States Supreme Court.